Midway through the retreat in Nicaraguya, we had a free day. A few of the girls went sightseeing in Granada. I spent our free day in Popoyo with a few surfing buddies from Jupiter. The word “homies” never meant much to me until I was sitting in backpackers paradise with no a/c or fresh water, disconnected from the contrasting luxury of my SwellWomen retreat, that I really appreciated the term— these guys felt like home; Kenny is my MIA photographer and I was stoked he was in Nicaragua the same time as our Surf & Yoga retreat; Roger and Fowler were guys I knew from the lineup. Kenny and I spent the day walking up and down the beach, surfing and catching up. When he went to the next town to run an errand, I watched Fowler learn to ride a motorbike and took a nap in a hammock. Kenny came back pretty late in the afternoon and it was time to discuss how I would get back to Playa Colorados; I had my board stored at Magnificent Rock and was hoping for a driver that spoke a little English. We started by asking the guy that ran Sunset Villas (whom Kenny affectionately calls Fat Man) and he set me up with a ride for $18. He said it would be 20 minutes, so we walked down to the store for a beer, said good bye to the Norwegian girls I’d become friends with and made a brief cameo appearance in Fowler’s GoPro video on the Moto before we walked back to the hostel where my chariot was waiting. 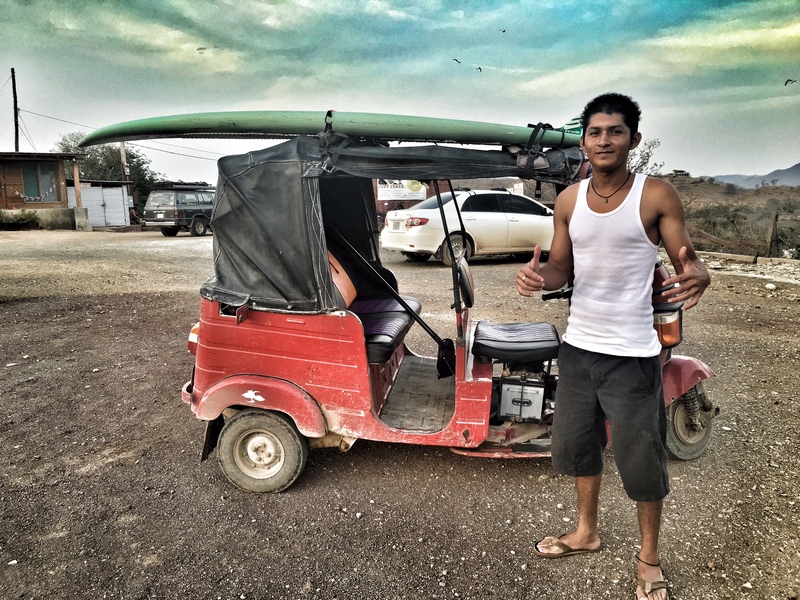 I’d never seen (or heard of) a TukTuk and was pleasantly surprised that it looked more like a golf cart than a motorcycle; although, I wasn’t entirely confident that we could strap the paddleboard to the top. Kenny tucked my paddle into the backseat and told Juan, my driver who spoke very little English, where to take me. I hugged the boys goodbye and they waved me off as I headed towards Mag Rock to pick up my board. We pulled up the hill that overlooks Mag Rock and I ran inside the restaurant to grab my board. When I walked out, Juan was already preparing to strap the beast on top. It was an old 9’4 from Hawaii, made before they started creating lightweight boards. Juan obviously knew what he was doing as I watched him expertly strap the board on top, so I took a picture and climbed in: ready for the cruise back to the resort. The ride was bumpy, but I enjoyed the open air. The previous nights’ rain had dampened the earth and a trip that would have normally been dusty, was pleasant while Juan was particular to steer around the rain puddles. The sun was sinking low towards the horizon and the heat of the day had finally backed off. It was sunset: My favorite time to stare at the sky. As we drove through the salt flats, the sky was turning colors to say goodbye to the day. Families were gathering outside their homes, preparing meals and the cows were literally coming home. It was a beautiful ride and I found a sense of timelessness. 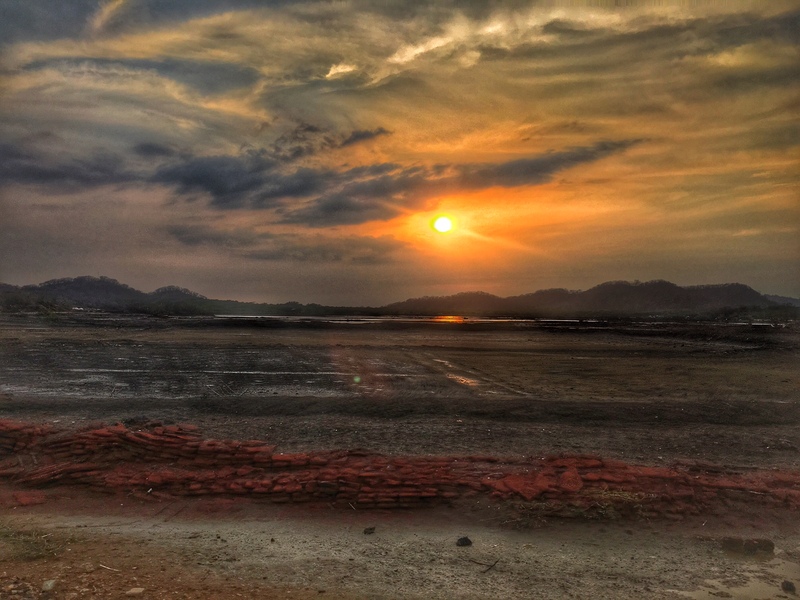 The landscape was a combination of hills, mountains, dried up rivers, barren farmland and thirsty trees that smelled like freshly thrown pottery; a pungent raw odor that matched the browns and oranges of Nicaragua’s drought. We finally pulled up to Hacienda Iguanas and with a little bit of negotiating while flashing my United States ID, managed to pass through both gates. 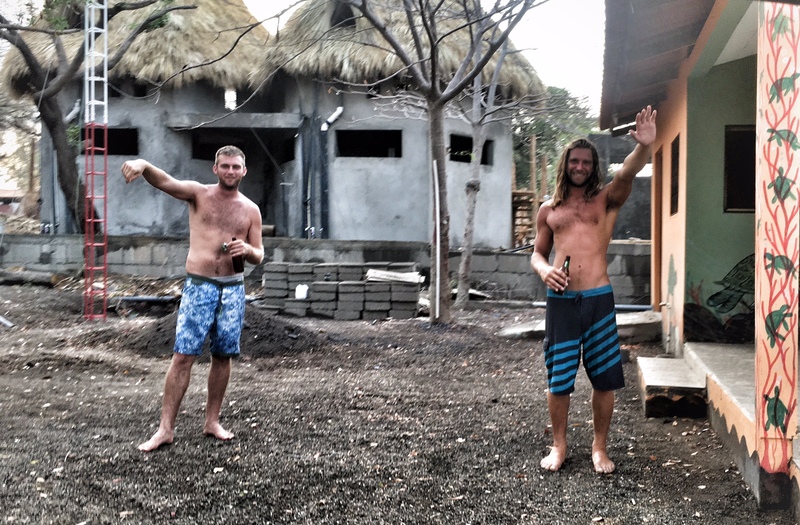 Juan delivered me safely to our Surf Villa, back into the lap of luxury where I reunited with the other Swell Guests ready for the remaining days of our unforgettable experience.